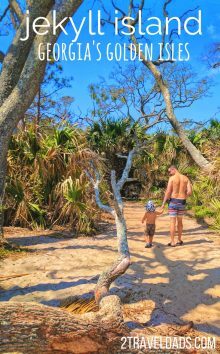 It’s been two years since we first fell in love with the Golden Isles of Georgia. 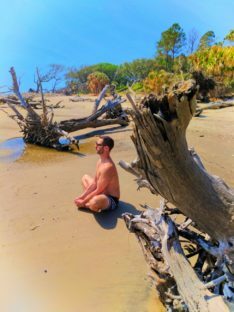 Our first experience was on St Simons Island when we visited the King and Prince Resort. From the food to the Spanish moss, we were hooked. And now we’ve gotten to explore another of the Golden Isles: Jekyll Island. Again, wow. 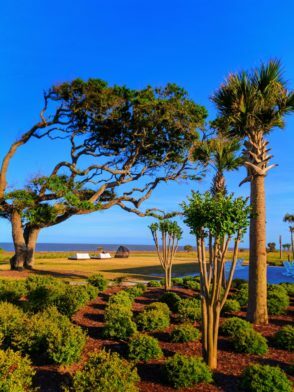 Jekyll Island is actually one big state park but then it’s also a town and a collection of beaches and hotels and golfing and… It’s funny to compare Jekyll with St Simons Island because they’re so different with such different attractions and a totally different feeling. 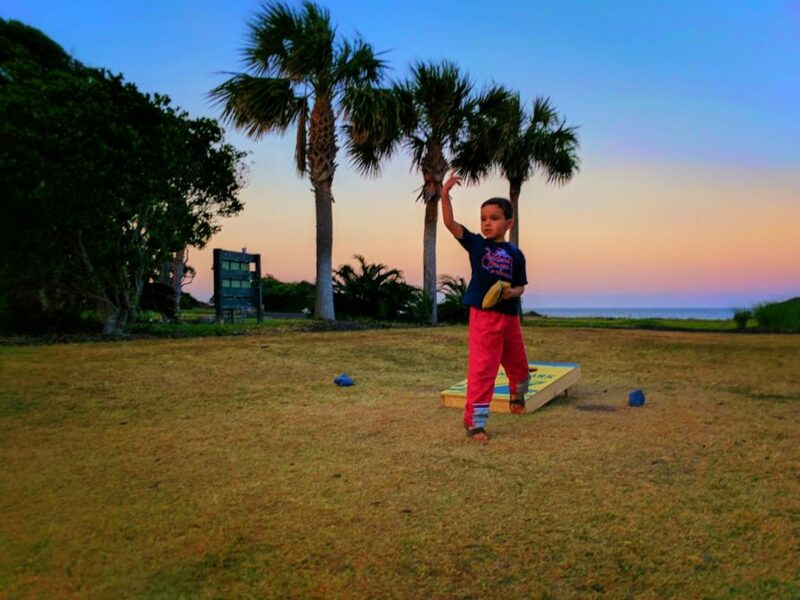 Take a look at our weekend on Jekyll Island and you’ll see why we’re ready to head back there for another soon! 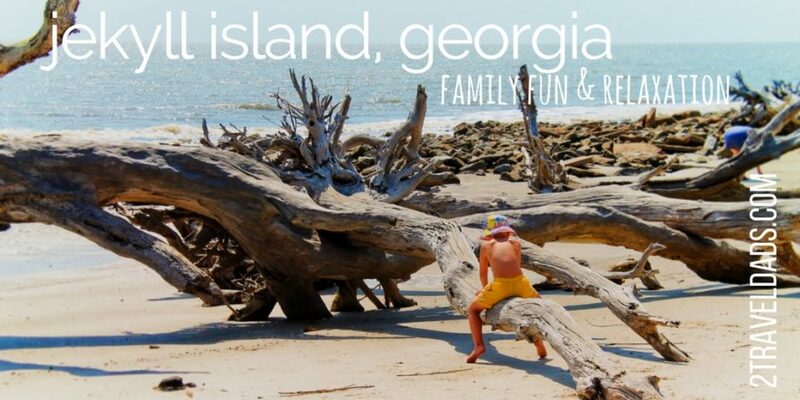 Jekyll Island is a part of the Golden Isles of Georgia. It is in the very southeastern most tip of Georgia almost at the Florida border. 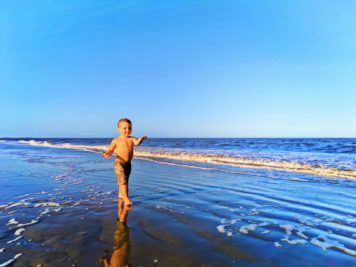 The Golden Isles aren’t far off of Interstate 95 which means that you can add them onto a trip to the Jacksonville or St. Augustine area or make them a stop off on your road trip North to Savannah or Atlanta. 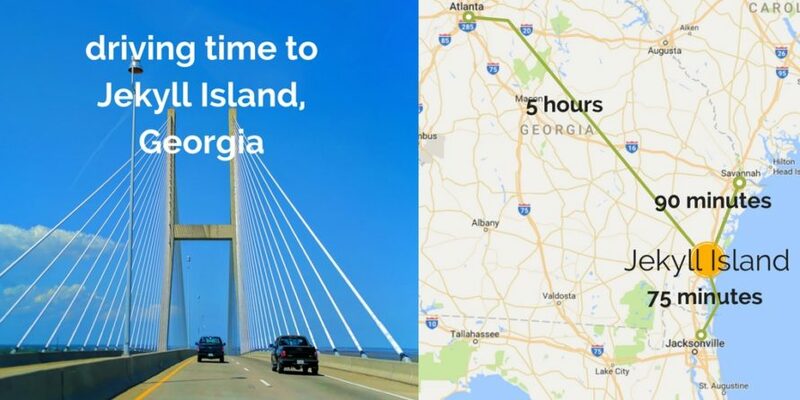 A great vacation plan would actually be to fly into Atlanta, bolt over to Savannah, head south through the Golden Isles stopping on both Jekyll and St Simons Island and then ending down on the Florida coast in Jacksonville Beach or St Augustine. Or we could go really grand and go down through Daytona Beach and loop around through Miami and then go up the Florida Gulf Coast. It doesn’t take much to make us go on a road trip. 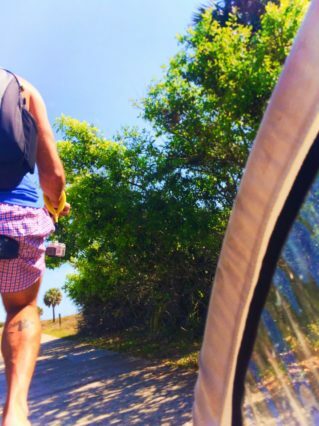 The southeast is perfect for a road trip like we’re talking about. 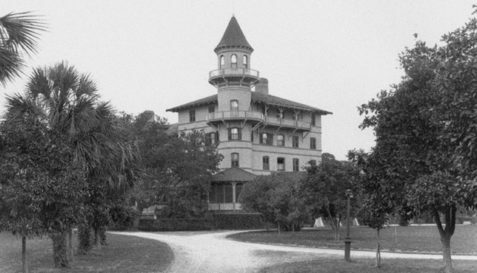 The town-site at Jekyll Island was initially founded as a club for the wealthy elite of the East Coast. 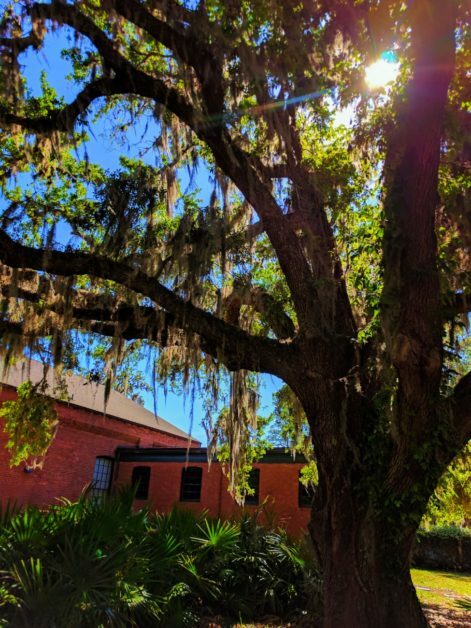 The live oak trees covered in Spanish moss that line the streets and cool historic buildings are reminiscent of its founding in the 1800s. 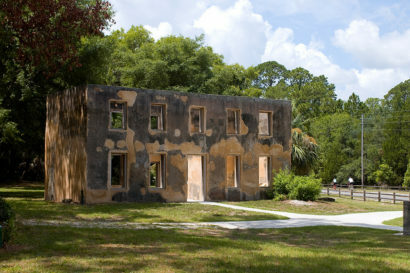 In an effort to preserve the really cool and beautiful historic community on Jekyll, in 1947 the state of Georgia bought the whole thing and turned it into a state park. The residents of the Island lease their land from the state but they own their homes… unless they live in one of the historic homes that are the state’s still. Besides the things that we did and are going to tell you about Jekyll Island also has some cool historic tours you can participate in. One of them is a tram tour that looks pretty awesome and takes you past all kinds of historic sites. 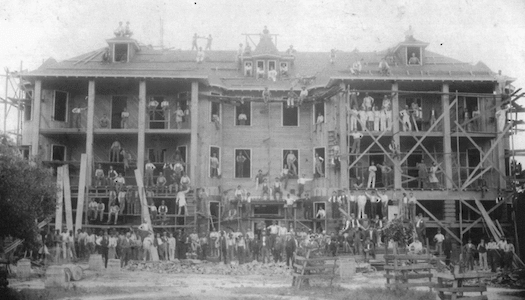 Another is all about the Rockefellers and their time on the Island. So much history and it’s so pretty. Being an island there are beaches all around Jekyll. On the west you’ve got the marsh lands with some small access points on the Intracoastal Waterway, but then as you round the island you’ve got the Atlantic Ocean sprawling before you. 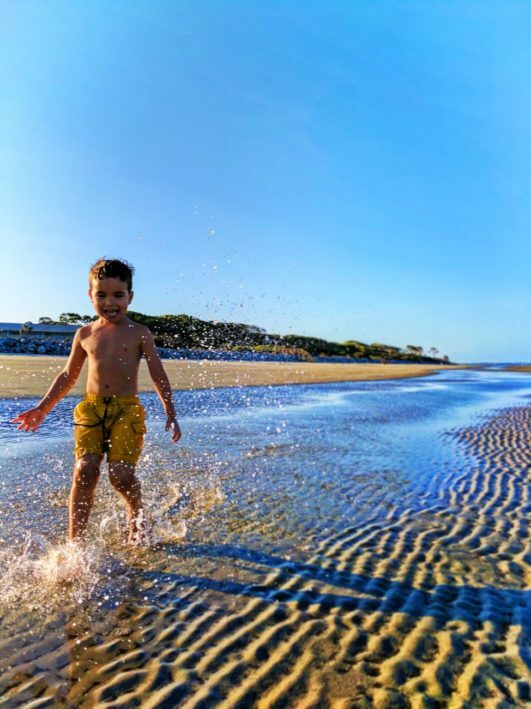 Just your standard beaches with the public access ramps and showers are perfect for any beach day here. The sand on Jekyll is a lot different than up on St Simons Island where it is quite mucky. Here it is just a bit more coarse and easier to clean up. 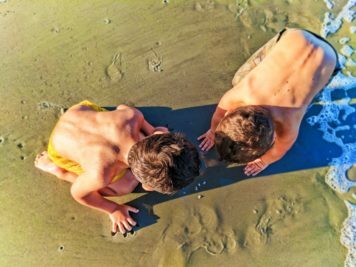 Tip: when the tide goes out there is plenty of space to sprawl and play on the beach. It’s really quite shallow when the tide is high so plan on being there for several hours of fun with any age kids. Besides the normal beach you would go to there’s another beach that’s a really weird and fascinating. Driftwood Beach is at the north end of the island and it’s cool, but it’s not the best place to go for a lounging beach day. 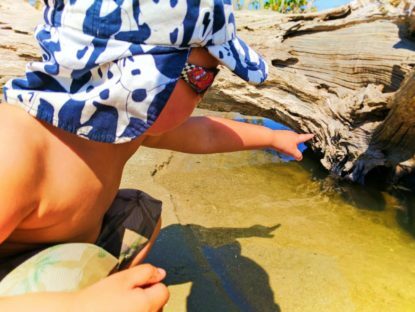 This is where you go to explore driftwood and look for shells with kids. Driftwood Beach is quite a site with some of the most amazing salt and sun bleached pieces we’ve ever seen. There are also very strange tidepools here that are just in the sand and have the same life you would expect to see in rocky tide pools. We found a few of them without anything living in them and we use those as splashing areas for the kids. 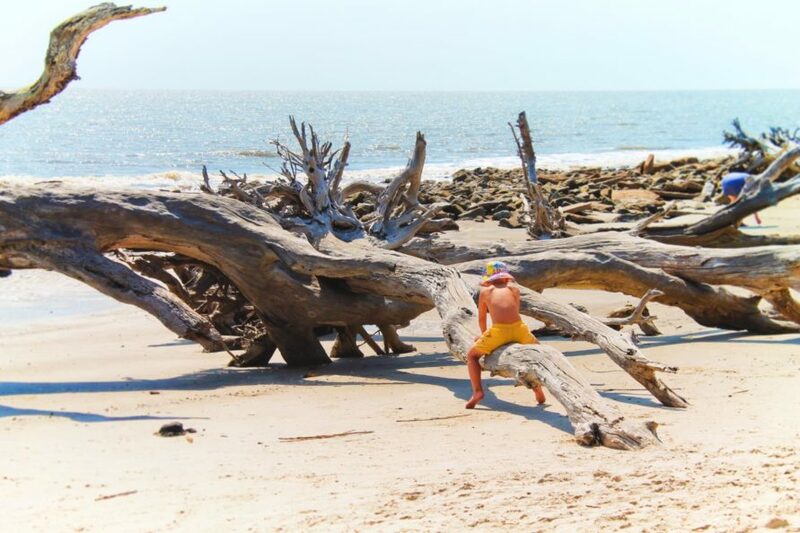 Note: The big attraction of Driftwood Beach is definitely all of the wood itself. Being a family all about photography and climbing this was perfect for us and the kids had a blast… And the dad’s got some amazing pictures. We love when we get physical activity on vacation. 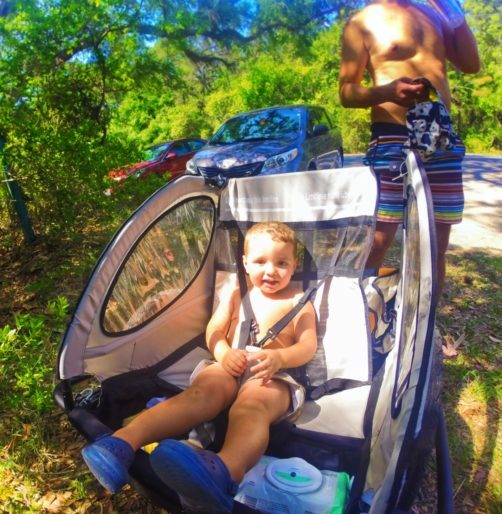 Biking really does seem to be our go-to lately, and also kayaking. 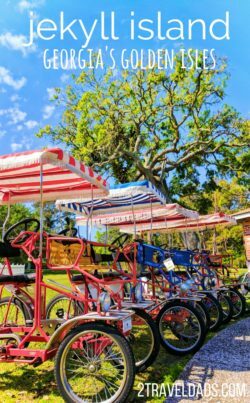 So when we were on Jekyll Island the opportunity to ride bikes along the beach and through the neighborhoods had to be taken. 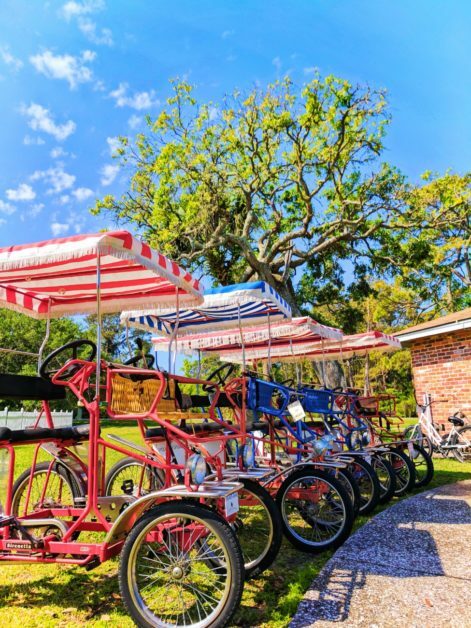 We rode bikes on St Simons Island also and got to go all the way out to Fort Frederica which was awesome. Here our bikes took us from the mini golf complex in the middle of the island all the way up to Driftwood Beach and back. FYI, even on flat ground beach cruiser bikes with child trailers will wear you out. Tip: Bring so much water that you laugh at yourself for how much water you’re bringing. You get so thirsty riding in the hot sun and then spending time on the beach you just get zapped. Especially the kids. 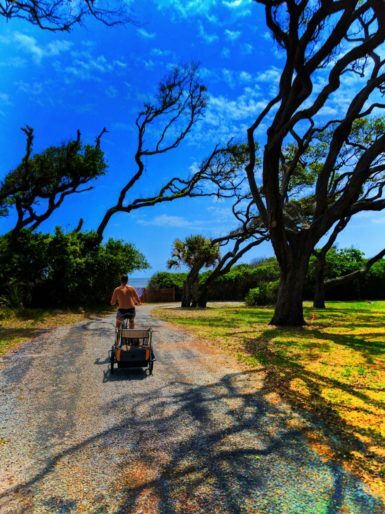 The biking paths of Jekyll Island are actually quite nice. 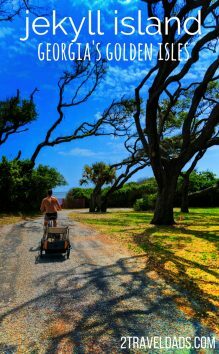 They are paved almost the complete way around the island which makes it very easy and quite safe. There were only a few spots where we had to cross any form of traffic and it was mainly just cars exiting driveways. Tip: Don’t forget to put on water-resistant sunblock before you start your bike ride. Even if you go nice and slow and allow the breeze to cool you off, the sun is going to beat down on you and you’re going to either have a really bad tan line or really bad burn line. Sunblock. What a cool place. 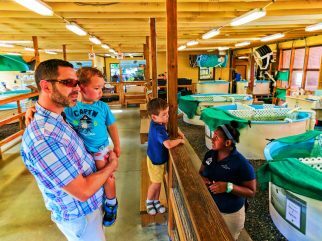 The Georgia Sea Turtle Center is such an inspiring center for kids and adults. We didn’t know exactly what to expect because the Georgia Sea Turtle Center isn’t directly on the water but upon entering we saw that it’s all about the life cycle of sea turtles, learning how they are impacted in today’s environment, and the actual medical attention and recovery side of having a sea turtle ICU. Fun fact: the release rate back into the wild of turtles brought in is 60%, which is amazing. 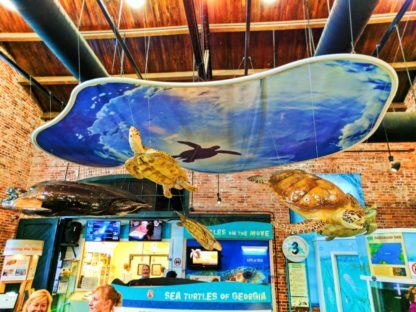 The Georgia Sea Turtle Center Recovery Department is much different than that of the Marine Science Center in Ponce Inlet Florida which we visited while in Daytona Beach. Both are operations full of heart and they’re working to make a difference, but they’re different. 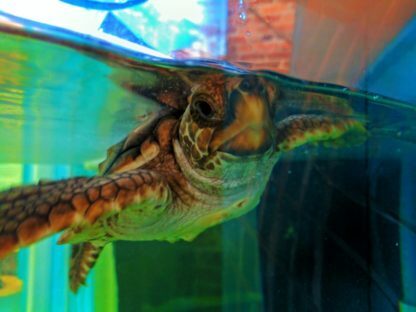 Here there are many more tanks and staff to assist and tend to the different turtles in recovery. And just like down in Florida the staff loves talking to kids and answering their questions. 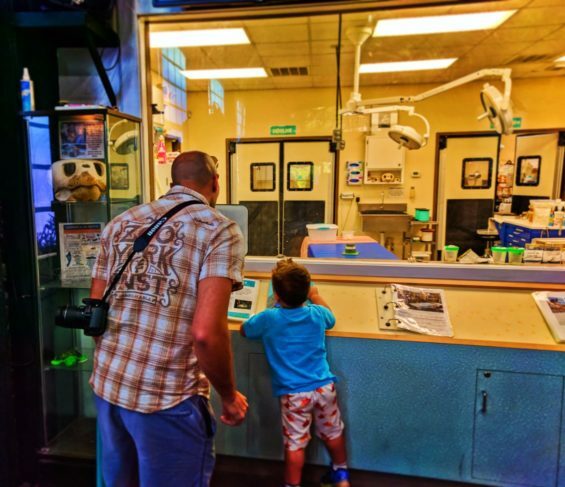 Note: if you have a kid who is already thinking about their career path, say even when they’re five years old, this is a great place to bring them to inspire a new interest and passion. After our first ecotour with a naturalist Oliver, our oldest, was ready to be a naturalist. And he wanted to be a sea turtle veterinary technician after the Georgia Sea Turtle Center. 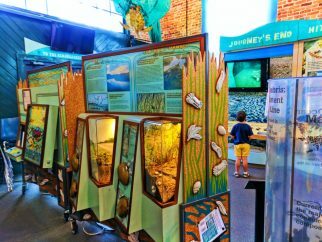 Jekyll Island has so many cool things for everybody to do. Take a history tour. Go on a boat ride with a local captain to watch the dolphins playing out in the Atlantic. 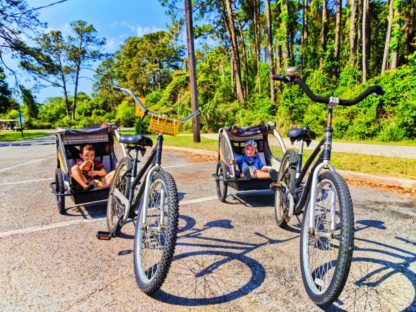 Book an ecotour on the Intracoastal Waterway to see what it’s like in this section of the Golden Isles. Be silly and just play mini golf and go to the playground in the sunshine. 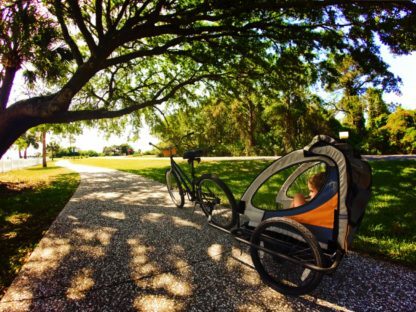 It’s the perfect spot for any age. Tip: check out Green Global Travel’s site for some more options for how to be wise and conscious in your tourism decisions. 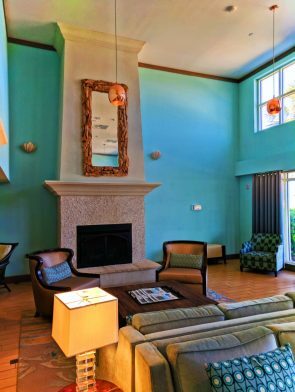 there are lots of major hotel chains with properties here on the Island or in the Golden Isles in general. 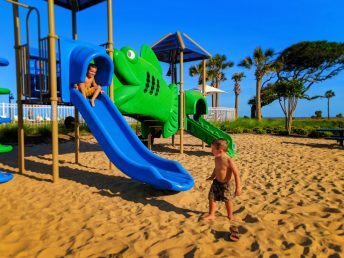 We stayed at the Holiday Inn Resort Jekyll Island and it was great. 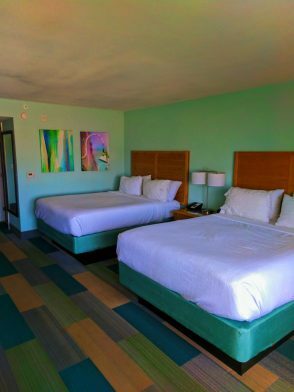 It was our first time staying in this particular brand and we were genuinely impressed. 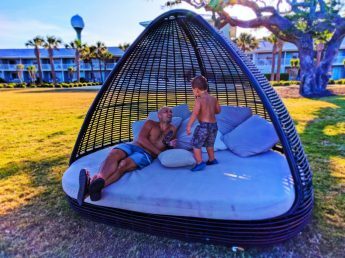 We had a deluxe Oceanfront room which had two beds and plenty of space for the kids to run around without causing too much ruckus or mess. We also had our own patio and access directly out to the pool and the beach. 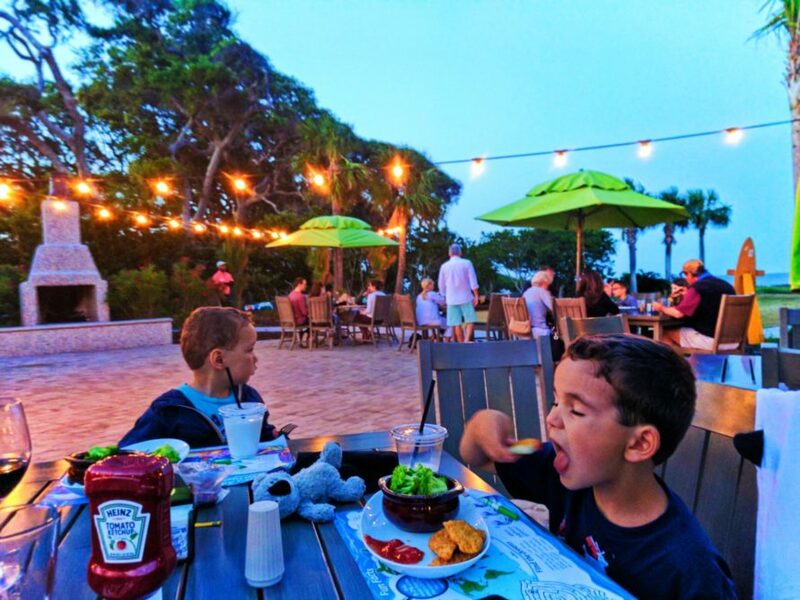 On property at the Holiday Inn Resort Jekyll Island there was also a pool bar which serves food and the Beach House Restaurant which did a great job providing kid-friendly options and local cuisine, not just hotel food. It was a nice surprise. And something we’re always thankful for when we are having beach days are showers close to the beach. 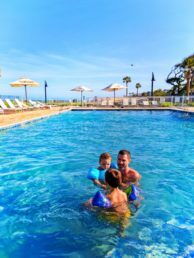 On our Florida Gulf Coast road trip we really took advantage of these… And we took advantage of them here at the Holiday Inn Resort too. They don’t want their rooms to get extra dirty just like we didn’t want our van to get extra dirty. Be a smart tourist/vacationer and leave the sand at the beach. So it’s funny, when we left St Simons Island last time it was our favorite little island community we’d ever visited. 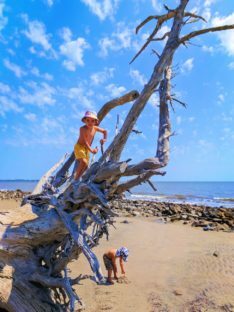 And then we came to Jekyll Island and now it’s our favorite little island community. 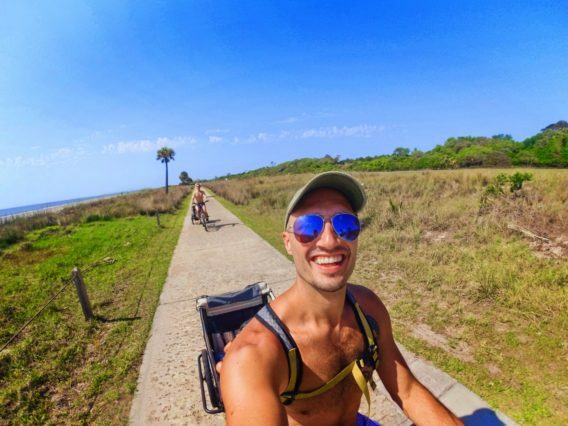 Because you can’t go wrong with either, why not on your next East Coast road trip or Georgia-Florida trip carve out some time to hit up Jekyll Island or the Golden Isles as a whole. You will be so glad you did and you’ll have an unforgettable family vacation. 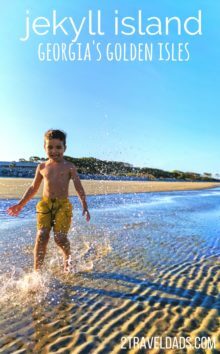 Want to pin this for later for when you’re planning your Georgia Coast trip? Go for it!